DNKL is happy to announce that Geshe Dhargey will teach Mahāmudrā over a series of five Saturday morning sessions. Mahāmudrā, the great sealing nature, refers to systems of meditation on both the conventional and ultimate natures of the mind. 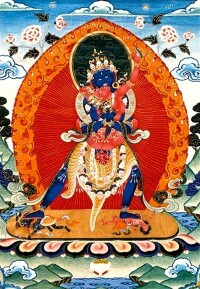 This system of practice, which is based on the canonical sources of the Prajnaparamita Sutras and the Anuttarayoga Tantras, was taught by such great Indian masters as Saraha, Nagarjuna, Mahasukha Natha, Tilopa, Maitripa, and Naropa. The main instructions focus on techniques for meditating upon the mind in order to achieve one-pointed concentration and attain a realization of the mind’s ultimate nature. This teaching will follow the root text entitled The Exalted Path of the Victorious Ones (T: rGyal ba’i gzhung lam), which was written by the Panchen Lama Lobsang Chökyi Gyeltsen (1570–1662). Since the teaching will address the non-Tantric elements of this body of instruction, there are no prerequisites or restrictions for attendance. Please be sure to register for this class so we can plan for teaching materials and lunch!